Many nonprofits show appreciation to repeat donors. First-time donors, however, can be met with little more than an automated thank you email. Feeling a lack of appreciation, these first-time donors may be reluctant to donate again. A common reason is that nonprofits want to devote their resources and attention to acquiring new donors, as opposed to nurturing first-time donors. What these nonprofits overlook is the substantial potential to turn one-time donors into repeat donors. First-time donors likely won’t feel appreciated if their donation results in an automated email. If possible, personally call each donor and thank them for their donation. Charities rarely call donors, so calls can make a great impression that can encourage future donations. According to a report from The NonProfitTimes, a thank you call increased the chances of a subsequent donation by 47 percent, illustrating the massive benefit of personally thanking donors with a warm phone call (source). To help collect contact information, suggest donors leave their phone number when they fill out the donation form. Even if they don’t pick up their phone, leaving a thankful message can provide a positive impression. You can also use the call to inform the donor of exciting future opportunities, which their donation will be aiding. When making the call, be sure to address the donor by name, while asking if it’s a convenient time to call. If the donor says no, quickly thank them for their donation and wish them a good day. For first-time donors willing to converse in detail, ask them questions to gauge their passions for the organization’s goals. For example, something like “what was an aspect of our organization that stood out to you?” or “do you have any suggestions for our future efforts?” shows you care about their input, as well as their donation. If you prefer to send an email, make sure it is far from the cookie-cutter variety. Still, emails should be the last resort. A phone call or handwritten note, sent via mail, leave a much more memorable impression and barely takes any time to do. To go beyond a thank you, it’s a great idea to host events that don’t involve fundraising whatsoever. Fundraising events can be great (and often necessary) but for first-time donors, they may feel like they’re being taken advantage of if those are the only events to which they’re invited. Instead, invite them to an event like a barbecue or picnic, perhaps with local musicians or artists for entertainment. The cost of food and entertainment can be well worth the retention of first-time and long-time donors alike. Hosting a live Q&A on Facebook Live (read about getting started with Facebook Live), or offering donors coupons and discounts, are other ideas to make first-time donors feel appreciated. Donors are aware that, even if a nonprofit has great morals and a focused vision, they can lack financial acumen. A way to alleviate these concerns is to elaborate on how the organization uses donations. Strive to be as transparent as possible when explaining where the donations will be going. You could point to a singular project or to how it impacts the organization as a whole. Many organizations lack the reporting and analytics to get overly specific regarding donations. Considering a recent BDO survey revealed that 42 percent of organizations have no consistent framework for measuring and recording, your nonprofit has all the more reason to do so. Having a great basis for this can make an organization seem more organized, focused and financially prepared compared to other nonprofits. A study from “Fidelity Charitable’s Time and Money: The Role of Volunteering in Philanthropy” found that 43 percent of donors volunteered first before donating to an organization, indicating that many donors are genuinely committed to the cause at hand. 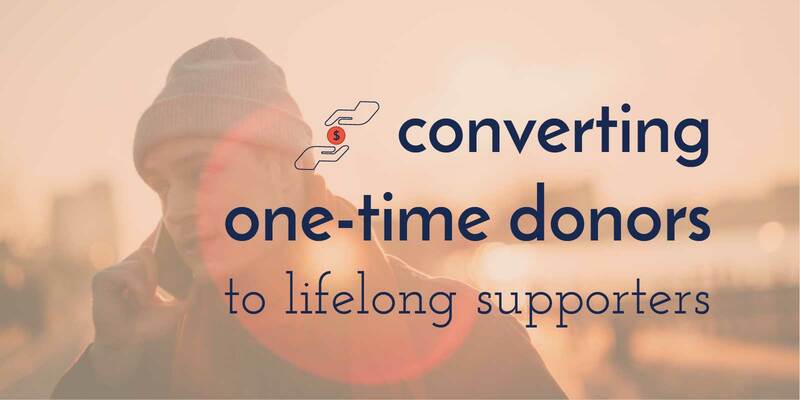 Regarding first-time donors, offering even just a one-day volunteer opportunity can make them feel extremely wanted, showing them that their presence and skills are desirable, sometimes even more so than their monetary donation. These invitations can not only help grow an organization but can also turn first-time donors into repeat donors. Either on the donation page or when thanking first-time donors personally, mention that there is an automated option for monthly donations. Monthly giving helps charities gain consistent income and is more convenient for many donors. Providing this option upon their first donation, when they are attentive toward the organization’s goals, makes the automated prospect even more attractive. Donors can set whatever amount they’d like to donate automatically, noting the added convenience. One-time donors provide a great opportunity to develop a nonprofit’s following. The fact that they donate even just once shows they like the organization to which they’re giving. This then plants a seed for engaging follow-ups that can turn first-time donors into repeat donors. Writing for more than five years, Kayla Matthews has contributed to publications like NonProfit PRO, The Nonprofit Hub and Volunteer Match. To read more posts by Kayla, check out her blog, productivitytheory.com.